Ever hear of the "winter blahs?" It’s a sluggish state of mind that hits, sometimes, around mid-January, then reaches its peak around mid-March. It doesn't normally end until we’re energized by the first greening of trees, the blooming of an early wildflower, or the smell of warm sweetness in the air. Those tell us that Spring is about to be sprung from a cold, colorless landscape. 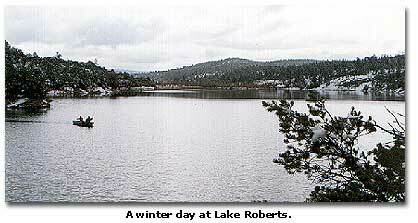 Up here at Lake Roberts, New Mexico, however, the best remedy for the winter blahs is some much needed rain, or waking up to see our incomparable Gila Forest and surrounding mountains blanketed with snow. Even extreme weather is good. On occasion. Earlier this week, it rained some, then, those fat, white flakes fell while we were tucked snug in our beds. The dose of seasonable weather gave our spirits a welcome boost. In fact, all of us mountain folk were delighted! We were beginning to think winter took a vacation somewhere else. If we’d wanted to live in a year-round toasty clime, we would have all moved to Florida, not southwest New Mexico. We’re not odd, we just happen to prefer four diverse seasons. For dedicated anglers, Lake Roberts is a good place to hang out all of the time. A frosty clear morning after a snowfall is extraordinary. Especially when the fish are biting. What better way to partake of all this than from the middle of the lake in a boat, with the sunshine bouncing off a dazzling white landscape set against a backdrop of deep blue sky? It was not I out there, catching my limit of rainbow trout on Monday morning, though. I was walking the upper end merely enjoying the scenery and the antics of my four-month-old puppy, Maisy, when a fisherman pulled up to the boat dock. At least I thought it was a fisher "man." The man turned out to be a fisher woman, Linda Starr, from Portland, Oregon. (No relation to Ringo or Kenneth Starr.) She was bundled up to the eyeballs, which was why I hadn’t correctly identified her gender. After I admired her catch, she complimented me on having the good sense to live in such a beautiful community, and she told me a little bit about herself. This spunky lady was playing hooky from a family reunion in Silver City. 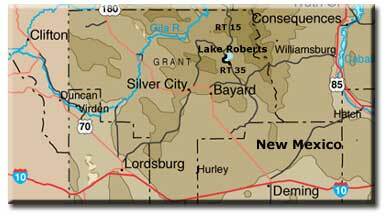 (About an hour’s drive away, through fantastical, white-laced Chihuahuan high desert vistas!) Her husband couldn’t get out of the "clan" doings. (It was his clan.) The couple had never been to our area before, but since both are retired, they spend several months of the year, traveling the country in a motor home, small pickup in tow, checking out fishing holes along the way. On this sunny but not-so-warm day, she caught her limit of trout, happily admitting to a liking for fishing alone sometimes. She did seem very practiced at hauling the boat out of the water and loading it onto the trailer, waving aside the help I offered. As we parted company, I thought, what an interesting experience. But then, chance encounters with strangers often are. She goes fishing to cure the winter blahs. Seasonable weather  and meeting someone who takes enormous pleasure in being alive  is the only prescription I need. 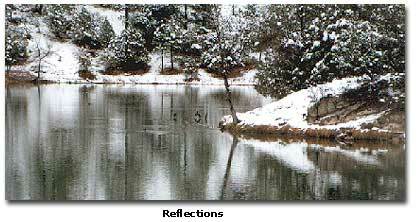 When I see Linda again, I’ll pass along this bit of information from New Mexico Game & Fish. In addition to the 2200 rainbow trout introduced into Lake Roberts in January, the trout population will increase by 2200 more the first week in April and another 2200 in May. Should be good fishing in the months to come. 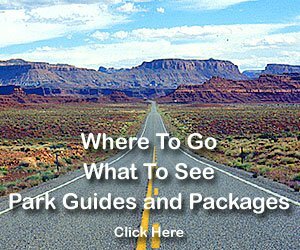 Lake Powell video The completion of the Glen Canyon Dam in 1963 created Lake Powell. It took another 14 years to fill the lake. With almost 2,000 miles of shoreline, and five marinas. Lake Mead - Houseboating & Viewing Hoover Dam DesertUSA rented a houseboat to explore the western part of Lake Mead. Our first stop was the Hoover Dam off the Boulder Basin. Without Hoover Dam, Lake Mead wouldn't exist today. Come along with DesertUSA staff as they explore Lake Mead and check out Hoover Dam. Take a look at the cove where we camped, and the Bighorn Sheep encounter we had there!